We'd be doing you and LiquidText a disservice if we just called it a PDF editor but at its heart, that is what it is. It's so much more than that, though, that the PDF element seems almost incidental. LiquidText 3.0.11 for iOS is about gathering ideas and making something useful out of them. You can do regular PDF work in it. Just as you might with Adobe Acrobat or PDFpen, you can create PDFs and edit them to at least some degree. 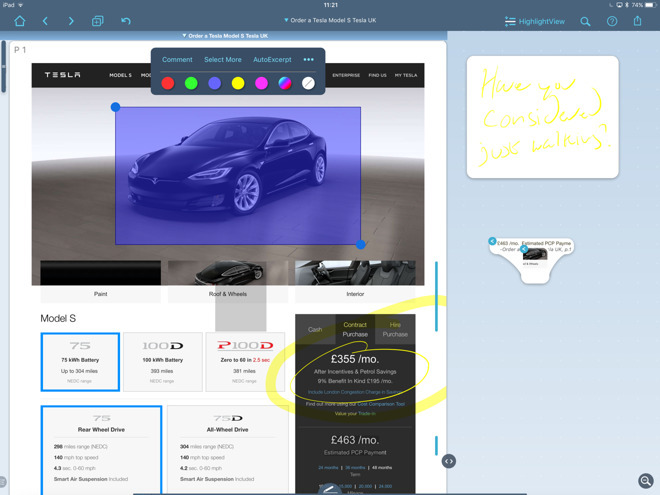 You can annotate them, too, and that's where LiquidText starts to show its muscle. It handles PDFs of course but also Word and PowerPoint files. Open one of these in LiquidText on your iPad and it first turns it into a PDF. So if you just wanted to convert that Word document into one, you've just done it. By far the app's most striking feature, though, is how you can pinch to collapse parts of your document. It makes a PDF act like an outline except rather than levels that you elect to see or hide, you pinch your fingers together and it squishes up everything in between. Say you're writing a screenplay and you feel a character isn't working out. 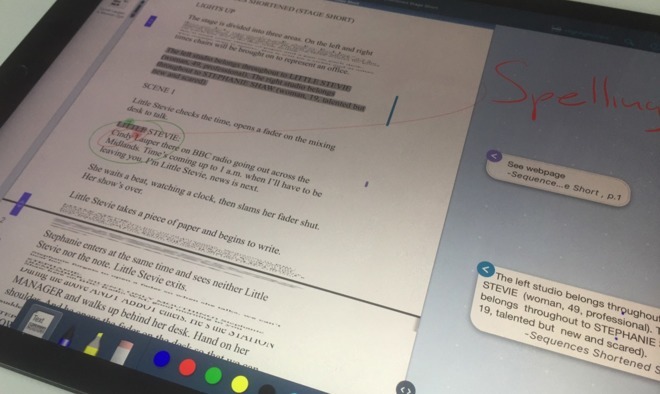 Find their first scene, excerpt that by just dragging the text to the work space, and keep referring to it as you read through their other scenes. That workspace can as big as you want it to, and it shrinks as much as you care to pinch it. Collate lots of elements on it or just the one: whatever you need to get your ideas moving around in your head. This pinching, this squeezing of lines is a little startling at first: it looks like there's a problem with your iPad's screen. Yet once you've found and used it, you keep coming back to it. If you're more of a corporate type and have to deal with pie charts, excerpt one the same way. Circle it, drag it out to the workspace and keep it there. Annotate it with handwritten notes. It's easier to scribble a line over your document and then handwrite on the workspace but you can also choose to create text boxes that you then drag around. Drag together two elements on your workspace and they connect. Drag three, four or as many as you like and they all connect into one blob-like element. It's like you've got a messy desk with notes strewn and random lines doodled between them —except it's a regulated mess and the lines are never random. LiquidText makes you feel like you've got a paper document that you can crumple, tear bits out, doodle all over and in every other way fold, spindle, and mangle it while you work to make the best thing you can. Yes, Adobe Acrobat and PDFpen can do the boring stuff but LiquidText can be engrossing. There's just this irony that an exquisitely gorgeous app lets you make such horrible messes of your documents in the interest of data access and editing. But, what you do with that document afterwards? LiquidText files are really intended just for you, and to be a working document rather than something you prepare to send on to other people. You can share your LiquidText work over email and what your recipient gets depends on whether they've got LiquidText too. If they have, then they get your scribbles in all their glory. If they haven't, they get a PDF with a range of options regarding how much get to see or your working notes. It'd be good to see LiquidText accept more types of documents and it'd be handy to at least refer to them on your iPhone. LiquidText is not meant to be a PDF editor per se, you won't use it to create much. It's really for reading and doing intensive annotations and edits. Nonetheless, the way it does that makes you wish every PDF reader app with annotation features worked the same way. We talked about sharing documents. It may not be a major hassle, as the app as it's free to download. If you're only ever going to read someone else's LiquidText documents, it's all you need. But, to work on documents of more than a single page, you can buy the $4.99 multi-document in-app purchase. To get that plus all of the editing features, there's the Pro version which is a $19.99 in-app purchase. Try out the free version but skip the multi-document edition and go straight to the full version of LiquidText 3.0.11. 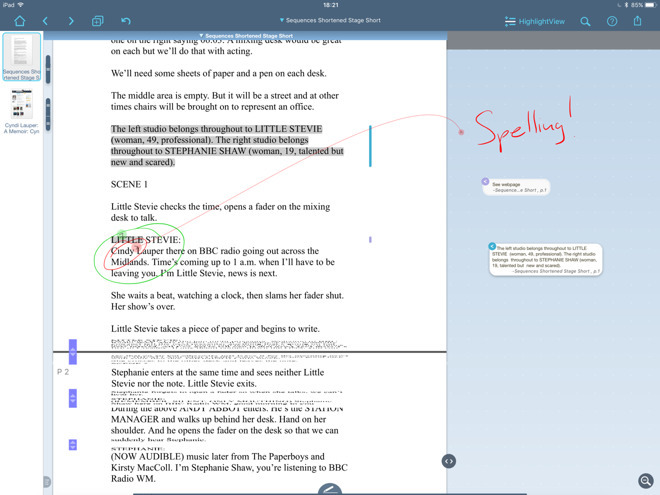 It's an iPad-only app and though it doesn't require an Apple Pencil, you'll want one to get the most out of LiquidText.